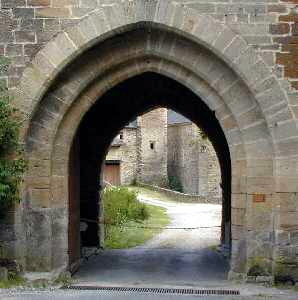 The Abbey of Bonnecombe was founded in 1167 by the Cistercien Order, they were in continuous occupation until the French Revolution in 1791. This was a disaster it was sold, pilaged and eventually became a barn. 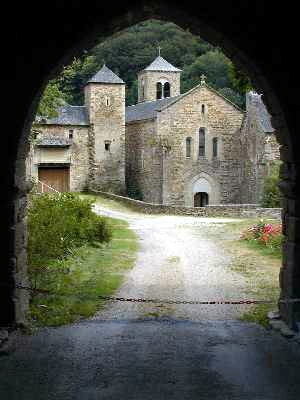 Monks returned in 1889 and started a reconstruction which continued until 1965. Since May 1998, it has become a part of the Communauté Catholique des Béatitudes. It is to be found in the “lost” Valley of the River Viaur, to the South of Rodez, just before the village of Cassagnes Bégonhès. 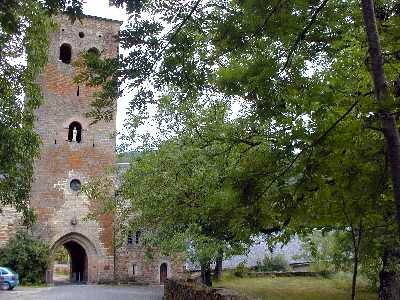 As you approach down the lane through the trees, the Gate Tower (Tour St Bernard) emerges through the trees, this was the defence against marauders during the 100 years war and evokes the French Time Travel Film “Les Visiteures”, set in the Middle Ages/20th Century.